16. Adonis L., Sp. Pl. 538. 1753. Gen. Pl. ed. 5: 618. 1754, Boiss., Fl. Or. 1'.15. 1867, Hook.f. & Thoms. in Hook.f., Fl. Brit. Ind. 1:15. 1872, E. Huth in Helios 8:61-73. 1890, Bobrov in Komarov, Fl. URSS. 7: 528-539. 1937, Riedl in Ann. Naturh. Mus. Wien 66: 51-90. 1963: Shteinberg in Webbia 25:299-351. 1970, Qureshi & Chaudhri in Pak. Syst. 4(1-2):201.1988. Annual or perennials with a simple or branched stem and with finely dissected leaves. 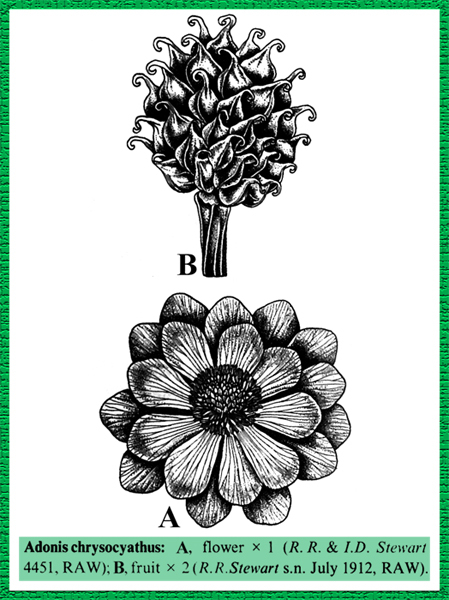 Flowers solitary, terminal on the main stem or on lateral branches. Sepals 5-8, usually thin, pellucid. Petals 5 to numerous, petaloid, red or yellow, rarely white. Stamens numerous. Carpels arranged in a subglobose to cylindrical spike, developed as 1-seeded nutlets, rugose with a distinct beak at maturity. Most of the species are poisonous. About 20 species arranged in two sections, Consiligo DC., Syst. Nat. 1:224. 1818, comprising the perennial rhizomatous species with usually more than 8 petals, and Adonia DC. Syst. Nat. 1:221. 1818, comprising the annual species with 5-8 petals. They are widespread in the temperate regions of the Old World, the annual species often found as agricultural weeds. Represented in Pakistan by 3 species. Adonis palestina Boiss., Diagn. Ser. 1, 2 (8):1. 1848, Qureshi & Chaudhri in Pak. Syst. 4(1-2):204.1988. A species resembling Adonis aestivalis, but with stems generally branched from the base and achenes not toothed near the apex. Reportedly collected from Baluchistan (fide R.R. Stewart, Ann. Catalogue Pl. W. Pak. & Kashmir, 260. 1972). Type: Samaria, Ramla-Hierosolyman, April-May, Boissier s.n. (G). Distribution: Syria, Palestine to Pakistan. Fl. Per. : April-May. Adonis aestivalis var squarrosa (Stev.) Boiss. = Adonis aestivalis L.
Adonis inglisii Royle = Adonis aestivalis L.
Adonis pyrenaica Hook.f. & Thoms. = Adonis chrysocyathus Hook.f. & Thoms. Adonis squarrosa Stev. = Adonis aestivalis L.